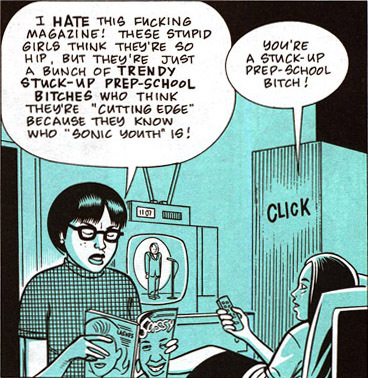 and Enid Coleslaw of Ghost World. When I think of Daria, I think of sarcastic one-liners, I think of the nineties, and I think of her awesome glasses. They somehow frame her not-so-amused expressions perfectly. While the glasses might be the physical sign of Daria’s outside status, it is her attitude and expressions that are the emotional signs. When she declares “I’m not miserable. I’m just not. Like. Them.,” she efficiently explains why she is on the periphery of the high school social scene. With her glasses, Daria does not look like anyone else. But she, thankfully, doesn’t act like anyone else, either. That’s her choice and that makes her (sort of) happy. And I might as well address this right now: With all due respect to Dorothy, being an outside girl does not automatically mean that the girl is asexual, ugly, or awkward*. Daria might think that 95% of people are idiots (and she wouldn’t be wrong), but she still has crushes, desire and even Tom, her boyfriend. However, in my mind Trent and Daria are the true couple in the show. But that is neither here nor there. How does she deal with this lack of satisfaction? She constantly changes up her look (and rocks some of the coolest specs ever), refuses to look towards the future, antagonizes everyone, and aligns herself with hobbies, music and people outside the mainstream. She has a prickly demeanor, but her journey within the graphic narrative and movie is quite existential. Enid is looking for some sort of meaning and depth in a world that is void of anything substantial. Unfortunately, her decision to go on this journey separates her from most of the community (which she doesn’t mind) and her best friend Rebecca (which Enid does mind). Enid’s search of life in the ghost world keeps her stagnant in one mindset, while Becky is evolving into an adult. Enid is definitely an example of the dark side of the Outside Girl, but she keeps her integrity. At the end of her story, Enid tries to start over. She leaves town and searches for fulfillment elsewhere. And I hope her clean slate brings that outside girl some meaning. *Note: Some outside girls might be asexual or feel awkward and could sport unconventional looks. But those are supplementary traits. They do not define the characters and outside girls are not classified in those terms.